A few lads out and about on the Lecht road a couple of weeks ago. I wonder what they were up to? 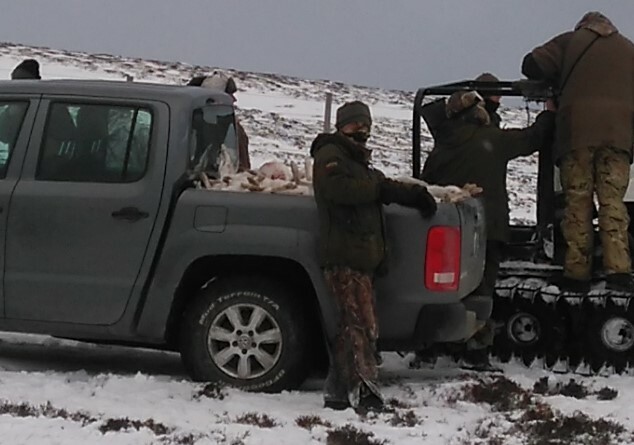 The back of that vehicle is full of a mountain of Mountain Hares. So the voluntary restraint seems to be working as well as we might have expected then? Right! Mountain Hares (or Blue Hares) are bumped off on grouse moors because they are inconvenient species. No, they don’t eat Red Grouse (not often anyway) but they do carry ticks that carry a virus (Louping Ill Virus, LIV) that gives Red Grouse (and sheep) a disease (see Inglorious pp75-76 and p237). This is what SNH says ‘On the basis of the available evidence, there is no compelling field evidence for undertaking large-scale mountain hare culls to control LIV in areas of Scotland where there are high densities of other tick-bearing mammals. Culls should therefore not be undertaken for this purpose in these circumstances.‘. Quite a big failure wasn’t it? How many hares do you think it takes to fill the back of that car? No we don’t know that it is full of hares, maybe they are just the icing on the cake? How many? 50? 100? 200? More? Great restraint. This activity takes place inside a National Park – that rather worthless designation in the UK which stops people building but allows the killing of wildlife for fun. The Cairngorm National Park website says that there is ‘nowhere else like the Cairngorms National Park’ which isn’t really true when wildlife is not protected any better inside the Park boundaries than outside them, is it? They are right to have the word ‘Breathtaking’ in large letters on there website because that is what the current state of affairs is. And they are right to say that the CNP is ‘home to some of Britain’s most loved but endangered species’ – tough love for Mountain Hares in this National Park. In May 2014 the Convenor of the Cairngorms National Park Authority complained to the Environment Minister that continued raptor persecution in the area “threatens to undermine the reputation of the National Park as a high quality wildlife tourism destination”. He can add Mountain Hare culling to that list. If you would like to comment on the future of the UK’s National Parks then click here. More on the importance of culling hares for the pointless hobby of grouse shooting here, here, here, here. It's not Mountain Hares here but Roe Deer. Same reason. They carry ticks. These Red Grouse moors in England shoot on sight. Sheep are dipped to kill ticks bur Roe Deer wonder at will and spread the ticks which cause 'looping ill' in Red Grouse. There is a close season for Roe Deer both for bucks and does but like birds of prey the law does not count on a Red Grouse moor especially when you have the police in your pocket! I think that the content in back of the vehicle next to the land rover looks more like hare than roe deer. Awful lot of miniature albino Roe deer then. Either that or you can't tell a Hare from a deer! Wasn't John meaning it's roe deer that are culled where he is, not mountain hares (i.e. in contrast to the photo above, which are of hares)? You write "This activity takes place inside a National Park – that rather worthless designation in the UK which stops people building but allows the killing of wildlife for fun." Yes, "National Park" is a totally worthless designation - and it does NOT stop people building. For example, 1500 new houses are going to be built on the Rothimurchus Estate at An Camas Mòr just outside Aviemore. Yep, kill what you want and build what you want. And a hell of a lot of the houses at An Camas Mor will be second homes. If it was permanent social housing I would have far less problem with building in national parks, but we don't think the poor deserve housing any more. The UK’s housing crisis is an utter disgrace. We are the sixth wealthiest nation in the world. Only going to get worse too since Osborne's latest shenanigans with ESA, lots of people who cannot work will no longer be able to get enough points to qualify for benefits. What are they supposed to do but die in the gutter? Sorry for being off topic, Mark, but if we cannot get the toffs to take care of their fellow humans then what hope for the wildlife? just what I was thinking. Huge houses and grounds built in national pary in Sir Benfro/Pembrokeshire - depends who your architect is and how much money you have - and yes built for holiday homes. Les, I wish it would 'open the publics eyes' but I fear, as usual, it's only the eyes on this blog that will ever see it. Perhaps some journalist will get it into the papers while their editor is off on a shoot. Or maybe those great guys at the Beeb are even now planning a programme on grouse moor management, one that isn't slanted for their mates. Even if somebody broke ranks from say, Countryfile or Springwatch and made a programme, who would show it? No, I fear the public the publics eyes will remain wide shut! I sympathise with your cynicism, but I'm a little more hopeful. Rob Edwards has just covered the story in the Herald and ex gamekeeper Bert Burnett has predictably tried to poo poo implying it's a 'sustainable harvest', for human consumption I suppose but he never said.They are nervous about this - killing one animal just because you think it reduces the artificially high numbers of another to shoot for fun is pathetic and ludicrous. They did cover mountain hare culling on Winterwatch, but the concern was no accurate numbers of hare populations to base killings on rather than why do it at all. I can guess how Chris Packham felt about that! Fingers crossed, maybe, just maybe Friends of the Earth Scotland can be persuaded to initiate an appeal fund to support an anti bad estates campaign this year. If so finally there'll be an organisation north of the border that can just totally let rip which unfortunately conservation organisations can't when they are dependent on grants, sponsorship, may have constitutional restrictions re campaigning and nature reserves on the ground which means they have to negotiate with neighbouring sporting estates re 'management' issues (although personally I would prefer them to give them two fingers). FoES has no such concerns, and given the scale and range of problems caused just for sport shooting I think Greenpeace UK should get behind this too. The ammunition we have against the bad estates is phenomenal, people actually die in road accidents because of estates keeping red deer numbers high for god's sake, but the big guns have to be brought in to use it. This blog and Raptor Persecution Scotland punch way, way above their weight, but others will have to get involved to win this fight once and for all. That'll be a good conference weekend then! We hope that there is more to be shared and result from the weekend which those of us who couldn't make it can benefit from. Nice work. That is a truly shocking picture. Isn't it time some of this got into the national press? Totally out of control. Mark, I can't bear this. I know I'm over emotional about wildlife in general, and hares in particular, but surely, as other commentors say, these photographs could go somewhere...? Are they yours? Can I legally download the image and post it on Facebook for example? Can you? Can I do anything in relation to this event specifically? How can it be legal to kill so many (any) hares? And if it's legal, what is my best course of action to help it become illegal? I've contacted the Hare Preservation Trust about another matter but as yet have had no response. The website doesn't look very up to date, but if anybody knows anything I can do, please let me know. Don't know about downloading the image, but you could post links to it on your Facebook page or a Twitter account. What shocks me is that in Scotland's other national park the land mangement adviser is heir to one of the largest estates whilst her boss operates an upland hill farm. How can we change the way these areas are managed when those supposed to be advising on them are part of the fraternity? Well the Times was quick enough to publish an article last week condemning the RSPB science about heather burning. Lets see if they act as quickly in reporting this dreadful behaviour. Somehow I doubt it. Lets face it, these people wont stop until there is only a bi-culture of heather and grouse left. The picture is absolutely no shock to me I'm afraid, we've been seeing trailers filled with Mountain Hares in the Peak District for years. That same caught-in-the-act guilty look is the absolute standard for a Peak District gamekeeper too. Do try walking up to one with a pair of binoculars around your neck, it's painfully funny to observe their reaction, you can almost see 'what have they seen me doing?' running across their eyes. If you have spent any of your life in the rougher parts of a city you get to know the 'tells' of criminal intent and that is the standard appearance of our 'custodians of the countryside'. "How many hares do you think it takes to fill the back of that car" Well, if we could see the make and model of that truck, if anyone has a clear picture of the tailgate or can recognise it, then we should be able to come up with a decent approximation. We already know the average size of hare. It is fairly simple maths. It is an appalling and shocking picture. These culls surely have to stop. I'm not worried about the deer culls mentioned upthread though, those should continue and perhaps even be increased to all deer species. We need less deer but are too cowardly to reintrodue the wolf and lynx in order to control them naturally. Could someone write more about the 'National Park', the Convenor (name please) and the regulations pertaining to these parks, please. Maybe the name of someone in Scottish government to contact about this. Thank you, Keith - my group has drafted a letter to them, after reading your comment on RPS. But we are very easily ignored, so cannot big names who are listened to be asked to speak up? Is there anything practical to be done - or can we only keep bewailing such appalling events? This picture is quite simply obscene. How can anyone justify what these people are doing ? Mountain hare may be 'legal quarry' but surely that was never intended to cover the mechanised extermination of the species - and what is behind all this is probably well illustrated by probably about £75,000 worth of vehicles in the picture - nice Argos, you can chase down the prey without any effort at all. This seems to be a further reflection of the problem that Grouse moor management seems to have actually intensified in the last decade - thus the elimination of HH in England, where once one or two big estates recognised that getting rid of every single one didn't present a very friendly image. Not now. Neo-liberal attitudes, and the worship of super wealth, seem to have overriden all that. There is now no pretence of the pursuit of anything other than Grouse and money and this picture finishes finally any claim to be 'country and wildlife lovers'. So who are these people ? What estate was the slaughter on ? and why when the police seem to have become a branch of the gutter press, inviting the BBC to their raid on Cliff Richard's house are they so coy about naming the precise location of mass poisonings in Wales ? There are so many things wrong with this it's difficult to know where to start. I rather doubt the hares go into the human food chain, more likely they end up buried or in stink pits to attract and kill foxes, a few may even end as poison baits to indiscriminately kill predators illegally or used as dog food. 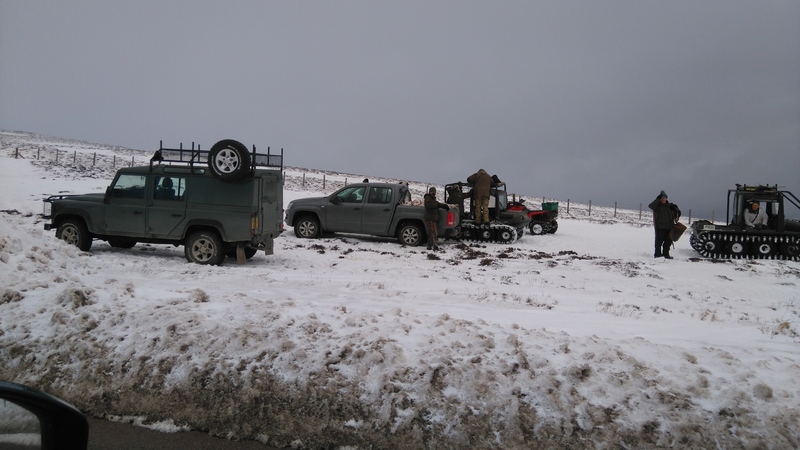 So much for the restraint called for by SNH, but then one of the great problems in our countryside is the problem of" We know best" exhibited by the game lobby and their friends. Perhaps the number of Mountain Hares would be naturally much lower if keepers did not spend much of their lives legally and illegally (Allegedly) shooting, trapping and poisoning all the hare predators. I can remember many years ago discussing with a keeper all the stoats he trapped annually in a particular dry stone wall. Some weeks later he was spending most evenings shooting the rabbits that inhabited the lambing field that wall surrounded. Hardly surprisingly he couldn't see the connection. Such a lack of respect/understanding for our upland wildlife and ecology must surely only hasten the end of these "Sporting" obscenities by the "custodians of the countryside." They often portray themselves as conservationists, rather than the warped pleasure killers they actually are. Bloody disgusting, these throwbacks from the Victorian era don't give a damn about any wildlife or the environment, all they're interested in is their precious overpampered and overstocked Red Grouse. Time grouse shooting was totally banned and put in the trashbin of unsavoury history where it should have been years ago. Disgusting thing to do, even worse considering there is no point to it. A rough estimate, the pick-up boot is 1.5 x 0.5 x 1.8 m which is 1.35 m3. A hare might be 15 x 15 x 30 cm which is 6750 cm3. Could be much less. So 200 hares, if the boot has only hares in it. Since the hares are piled up, there could be 300 or so in there.